am i the only one who's eyes are glazing over, overwhelmed by all the fashion week coverage? i have this weird, almost involuntary reaction to blog posts & newspaper articles (in WSJ and WWD, which we subscribe to in paper form and get at home every day) about fashion week and the various fashion shows everytime they happen, it's almost like information overload, my eyes refuse to focus and my brain shorts out. it's like i can't even look at it, and you know what? i really mostly don't want to! frankly, i find a lot of it boring, and irrelevant to my life. out of my price range, not my taste, etc., etc., etc. maybe it's because i am honestly inherently unfashionable, and i just sometimes think i am? a distinct possibility! maybe i should turn in my fashion card or something. i can hear my detractors saying, "'bout time!" HA. yes, yes, there are of course exceptions...i do pay attention to a select few designers. but i think i can count them on one hand. and i'm not rabidly pounding down the doors of style.com to see them the week of...i usually casually go back sometime afterward and peruse at my leisure, if at all. i guess, in thinking about it some, a lot of the designers i'm into probably honestly don't do a lot of shows and such anyway. not the big guns? all that is, of course, not to say *other* people shouldn't be into fashion week, and fashion shows, by all means, go on with your bad self if you like it and eat it up with a spoon! right on, ya know? more power to you! -am i the only one who doesn't get all into it? am i the only one who thinks it's kinda elitist and outdated? if you're not really into fashion week and all that stuff, why? 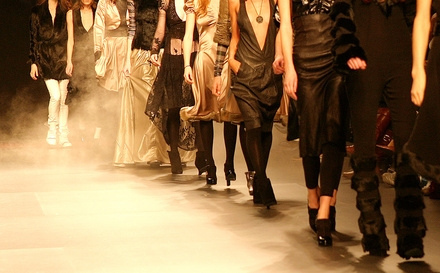 -for those of you who love the frenzy that is fashion week, what's the attraction? seeing the new trends? novel new ideas presented in an artistic manner? something else? what do you love about it? why does it get you excited? on a related note: just saw this post on the sartorialist where scott wonders about the possibility of really opening up fashion shows to the masses, i.e., regular folk freely attending/paying for tix, rather than just mostly fashion insiders/celebs. i'm wondering about how this could happen, what the benefits could be, as well as the downsides. what do you think that would do to fashion shows? would they be less elitist/exclusive? would their cache be taken down a notch or several? would that be in conflict with the aspirational marketing stance taken by many luxury designers? or could it be a good thing for designers, a way to make profit and be more inclusive? can you see any other potential pros or cons to such a scheme?